Please click here to sign RTF’s anti-roundup petition. Elko, Nevada — The Bureau of Land Management will begin a wild horse helicopter gather on the Owyhee Complex in Northern Nevada on Tuesday, Nov. 1. The purpose of the gather is to remove excess wild horses in order to prevent further deterioration of Greater Sage grouse habitat within the Sagebrush Focal Area (SFA) in northern Elko and Humboldt Counties. Overpopulation of wild horses leads to the degradation of rangeland resources, which adversely impacts habitat for other species as well as the horses themselves. The Owyhee Complex is located in both the Elko and Winnemucca Districts and encompasses the Owyhee, Little Owyhee, Rock Creek, Snowstorm Mountains, and Little Humboldt Herd Management Areas (HMAs). The gather will take place within the Owyhee, Little Owyhee, and Rock Creek HMAs which contains the majority of the SFA area within Nevada. The total gather area is comprised of 1,120,763 acres of both private and public lands. An aerial population survey conducted in August 2016 documented approximately 1,229 wild horses in the Little Owyhee HMA, 349 wild horses in the Snowstorms Mountains HMA, 285 wild horses in the Owyhee HMA, 779 wild horses in the Rock Creek HMA, and 32 wild horses in the Little Humboldt HMA for a total of 3,067 wild horses in the Owyhee Complex. 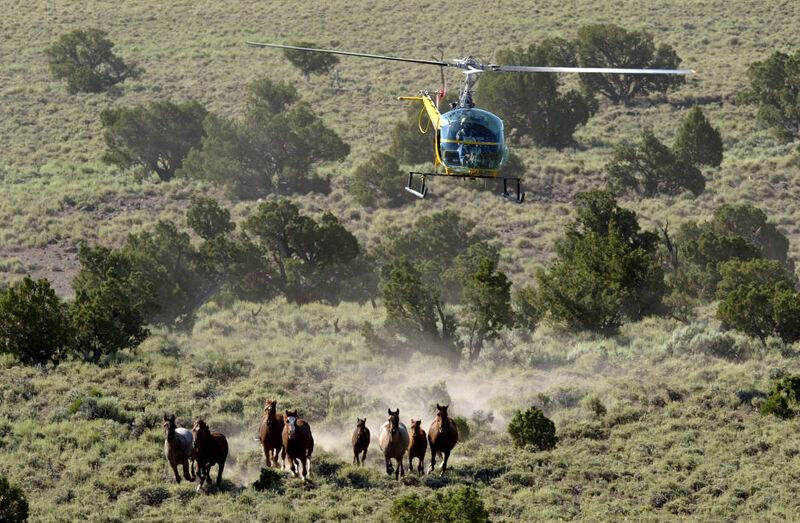 The cumulative Appropriate Management Level (AML) for all the HMAs within the Owyhee Complex is 483-779 wild horses. AML is the level at which wild horse populations are consistent with the land’s capacity to support them and other mandated uses of those lands, including protecting ecological processes and habitat for wildlife and livestock. The first portion of the gather will take place in and outside of the Elko District’s Rock Creek and Owyhee HMAs and will last until approximately November 24th. The BLM will gather 680 wild horses and remove approximately 450 excess wild horses from the range. The second portion of the gather is expected to start on the Winnemucca District’s Little Owyhee HMA on or after Thanksgiving and will conclude approximately the middle of December. The BLM will gather 920 wild horses and remove approximately 650 excess wild horses from the range. All mares not identified for removal will be treated with the fertility control vaccine PZP-22 to slow the population growth rate of the remaining population within the HMAs. PZP-22 is a temporary fertility-control vaccine that can prevent pregnancy in wild horses for 1-2 years. “This gather is a management action necessary to lessen the impacts of the overpopulation of wild horses in the Owyhee Complex has on important Greater Sage Grouse habitat” said Alan Shepherd, BLM Nevada Wild Horse and Burro Program Manager. “These actions are in conformance with the 2015 Nevada and Northeastern California Greater Sage Grouse Sub-regional Plan Amendment”. All the horses identified for removal will be transported to the Palomino Valley Wild Horse and Burro Adoption Center near Reno, NV where they will be prepared for the BLM adoption program. Horses not adopted will be placed in off-range pastures where they will be humanely cared for and retain their “wild” status and protection under the 1971 Wild Free-Roaming Horses and Burros Act. The BLM does not sell or send any horses to slaughter. For information on how to adopt a wild horse, visit http://on.doi.gov/1u25hEH. The BLM’s priority is to conduct safe, efficient, and successful wild horse gather operations while ensuring humane care and treatment of all animals gathered. The BLM and its contractors will use the best available science and handling practices for wild horses while meeting our overall gather goals and objectives in accordance with current BLM policy, standard operating procedures, and contract requirements.